This splendid old Crown Royal was part of a collection dating back to the early 1950s. Robust yet elegant, forthright yet subtle, complex yet integrated to the point of symphony, it was sheer indulgence on the palate. The Waterloo distillery where this ambrosial delight was made is gone now, converted to condos, offices, and parking lots. However, this particular bottling remains as the apogee of the blender’s art, and nothing short of Sam Bronfman’s legacy of quality and taste. When Seagram’s built an extensive new distillery in Gimli, Manitoba in 1969, they were responding to burgeoning worldwide demand for Canadian whisky. But by the early 1980s that demand had waned in favour of white spirits. The writing was on the wall for the future of the famed Waterloo plant. But unlike many other commercial enterprises, Seagram’s was in no hurry to turn its back on its heritage. Indeed, the company struggled to keep the Waterloo plant operating, at least to some degree, until November 1992, when finally, all operations ceased. A few months after its closure a fire quickly destroyed any lingering nostalgic hope that this noble old plant might one day reopen. Truly, this old Crown Royal from 1963 is bottled history that can never be remade. And yet, almost 50 years after its youngest component whisky was distilled this vintage bottle was so inexpensive to buy. People often send notes to canadianwhisky.org wanting to know the value of an old bottle of whisky. That’s a good thing in one way, but not so good in another. Since I do collect old Canadian whisky, it’s nice to have first chance to purchase a rare old bottle. But often when I tell people how much, or rather how little their old whisky is actually worth, they are left disappointed, wondering if I am just low-balling them in hopes of getting a bargain. There are two reliable sources of information for the current values of old bottles. The first is the results database of whiskyauction.com, a high-volume German website that keeps records of past sales dating back to 1997. Here, the bottles are listed alphabetically by country making it pretty easy to find what you are looking for. There is also a search function. But the prices on this site are European prices. Should a Canadian collector find a comparable bottle in Canada they will certainly pay more in comparison to these European prices. The other source of pricing information is the ubiquitous e-Bay. Someone wanting to establish the value of an old bottle can search Canadian whisky on e-Bay to see what’s for sale and what the bidding is like. The results are often surprising, and unless you are a collector, downright disappointing. For example recent sales have included a 1937 Canadian Club which sold to the only bidder for $150. A 1952 Wiser’s Oldest in a round bottle drew only 6 bids and sold for $66.67, and a bottle of Canadian Masterpiece from 1959 listed at $95.00 drew no bidders at all. Generally speaking, Crown Royal gets more interest than most other brands. Recent sales on e-Bay include a 1965 which sold for $87.29 and one listed as 1958 which sold for $103.32. Rare bottles, that is unknown ones, often draw no interest at all. Incidentally, sellers often date their old tax-stamped whisky incorrectly, so be careful. The date on the tax stamp (see inset above) is the date that the youngest whisky in the bottle was distilled, NOT the date it was bottled. So if the whisky has an age statement, don’t count backwards from the date on the tax stamp to figure out what year it is from. It is from the year stated on the tax stamp. As well, whisky is not considered to age in the bottle, so a 15-year-old whisky from 1952 is still 15 years old. For Canadians buying whisky from outside the country there is also another twist. It’s called the law. It is illegal for consumers to have whisky shipped to Canada. If we pick up a single bottle on our travels, and have been out of the country long enough, there is no problem bringing it home. However if we drive across the border to pick it up and return the same day then we have to pay duty on it. This also requires producing a receipt since the duty is based on the purchase price. Duty varies from province to province. In Ontario, for example, you can end up paying double since the duty and other charges can be as high as 100%. Luckily, although the ’63 Crown Royal bottle I sourced has an American label on it, I found it right here in Canada. Nose: A complex delight from the very first whiff of gingerbread and fresh-cut dry cedar lumber to the vague citric notes that reveal themselves on exhaling. While prunes and other black fruits sit front and centre, fresh red apples, caramel, vanilla, sweet peaches-and-cream corn, and vague hints of sweet-and-sour sauce come forward as well, only to be bolstered by clove oil and the whole gamut of rye spices. It has a dark complexity that only decades in the barrel can produce. This fills your nose with the dusky scent of leathery tobacco leaves hanging wilted in the kiln, and fresh sweet caporal cigarette rolling tobacco. And then there are lilacs and pansies, the prototypical floral aromas of well-aged rye. The nose of this 100% Waterloo whisky is a little more robust than Crown Royal XR, which it resembles, and is much creamier and fruitier than today’s De Luxe. Palate: Rich and creamy with sweet caramel and vanilla that is kept in strict control by a base of citric pith and the vaguest hints of oak tannins. Tingling hot white pepper evolves into even hotter cinnamon, hints of ginger and in the middle, clove oil, keeping the palate bright and alive. These joust, but playfully, with vague almost musty river plants, and a cleansing, cooling white grapefruit pith. The clean crisp oak of the nose is prominent here as well, though this whisky is so complex and tightly integrated that individual notes can just pop out for an instant’s recognition before re-joining the blend. The whisky is lush and full-bodied with a vaguely milk-chocolate feel. In addition to the luxuriant corn-derived mouthfeel, this whisky showcases the full range of typical rye spices including cloves, nutmeg, cinnamon, and ginger. Then come the breadth of undefined fruitiness and the sweet floral notes of pansies, violets, and lilacs. But there’s even more! There’s an almost fragile brittleness found only in old Canadian rye. It is much creamier and lusher than Crown Royal De Luxe, with lots more wood and dark fruits. It is also woodier, creamier, more pithy and much spicier than Crown Royal Reserve. Tasting next to Crown XR provides a marvelous revelation as notes of nutmeg waft from the 1963 Crown Royal. Although prunes are obvious right from the start in the vintage Fine De Luxe, it is not nearly as lushly fruity as Crown Royal Cask 16. The elegance of the old timer is better reflected in today’s Crown Royal Limited Edition, although this youngster is somewhat sweeter and its fire just a tad hotter. Next to the 1963 edition, Crown Royal Black tastes more of bourbon than rye. It’s amazing how whiskies show so differently when tasted in different company. Finish: A medium fade on citric zest, pith, and vague peppery fruitiness leaves you wanting more. It certainly does not have the staying power of the modern Crown Royals. Empty Glass: The morning-after glass just gushes with caramel, then slowly come hints of dry lumber. Unlike Crown XR there are no balancing sour notes, not that the Crown Royal blenders ever dreamt that someone might be intent on smelling their creation the morning after, never mind talking about it! This bottle was sold by a collector for $75.00. Old bottles of Crown Royal often sell on e-Bay in the $30 to $100 range. Considering the flavour, those are bargains indeed. Unless you find a Kansas City Royals fan who wants it for some special purpose, the bottle is probably worth less than $100, and that is assuming it is full with no evaporation and that the seals are all in place. Your best bet is to have a look on e-bay and see what other commemorative bottles are selling for. How much will a bottle of 1969 crown royal cost me? Best to check and see what the prices are like on e-Bay. Probably you can get one for somewhere betweeen $65 and $85. It is good whisky and worth more than that but that seems to be about the going rate. So I am a little confused. If the whiskey does not age once it is bottled, what is the difference between a De Luxe purchased today and the vintage De Luxe? Is it the Waterloo distillery? Like many things, whisky making has evolved over the years. With Crown Royal there are now five versions and Fine Deluxe has been replaced with another called Deluxe. Yes, the Waterloo distillery was a special place and the Waterloo whisky that is still left is reserved for Crown XR. Just wondering. I received a bottle from my aunt. It’s Crown Royal with a 1979 tax stamp. Is there anyway to know whether it is whisky from Waterloo or Gimli? It was a nice haul. I got the CR, a half full bottle of CC Classic (1975) and a full bottle of CN tower whisky(1972). The Gimli plant came on line in 1969 producing spirit for Crown Royal. The youngest whisky in your bottle was distilled in 1979 so almost certainly made in Gimli. That does not mean that a bit of Waterloo whisky didn’t get into the blend. Thanks for the reply Davin. Just wondering though, was Gimli used for the west & Waterloo for Ontario & east, or was there a mix between the two. No, Gimli was used for Crown and Waterloo for V.O. but remember there are many whiskies of various ages in Crown so there could still be some Waterloo whisky in the Gimli vattings for Crown Royal from 1979. I have about a dozen bottles dating back into the 1940s and have never paid more than about $75 for any of them. They just don’t go up in value all that much. You can have a look on e-Bay to see what others are paying, but it’s generally not a lot. Is it possible to make contact privately? My late husband had a large collection of Crown Royal and collectibles of Crown Royal and would like to speak with you re: these things. You can contact me through the contact link at the top of my website. Do you still have any older bottles of Crown Royal for sale? Whisky does not age in the bottle so it is the same age as it was when it was bottled. The year on the tax stamp is when it was distilled, before maturation time. It should taste like Crown Royal Reserve does today. where can one find a 1963 bottle of Crown Royal and get it either back to Canada or buy it in Canada? Are you aware of any brokers who are selling older bottles of crown royal? I have an unopened 1/2 gallon bottle of 1963 Crown Royal, still sealed, what is it worth? Thanks got one from 1963 from an old guy in Toronto off of Kijiji who had 2 bottles one from 62 and one from 63. He just happened to get them from Christmas and wasn’t a whisky drinker and had them in his closet all these years.Where did the whisky come from if the bottle is 1963 let’s say? The purple cap was discontinued more than 50 years ago. It is an old bottle. I bet it is quite tasty. I have a bottle that comes in a Brown box. The bottom of the box is what is called a library fold I believe. I have over 70 bottles of Crown and have never seen a brown box. Any ideas of age? Sorry, No idea. This would be some marketing person’s idea for a special promotion but not really of any additional value. The Reserve comes in a brown box sometimes. Would you want to sale any of the crown bottles you have??? Sorry. I do not sell whisky. If I buy it, I drink it. Please contact me if you still have that bottle with the purple cap. I would love to get it for my grandfather’s 90th birthday. Thank you! need to contact the canadian importers bottolers in St. Louis Mo. How can I do that. Sorry, I can’t help you/ I don’t know myself. Try asking at a local liquor store. Good luck! I have a bottle of crown royal that has a seal with the date 1979 on it. It has never been opened. does anbody know how much it is worth? It is worth between $50 and $75 or 100 if you can find a buyer. Hi there , I recently acquired a bottle (1963) in original bag and box. I have been un able to find any other currently listed on ebay or craigslist , or any other sites for that matter. Any other suggestions on locating a buyer for this ? I think e-Bay and Craig’s List have both discontinued alcohol sales. Your bottle is worth in the range of $50 to $100 depending on how badly a purchaser might want it.
. How much would it be worth? Does the taste of the whisky change after so many years? If it is still sealed and the level is good it is still drinkable. The flavour has changed over the years as the post above tells us. It is not worth a lot of money so go ahead and drink it as long as you are certain it is the real thing and has never been opened. It is almost certainly authentic. There are thousands of those old bottles around and they are not valuable enough for it to be worth anyone’s while to counterfeit them. I have many bottles from the 1940s that cost me an average of about $65. Thanks Davin. Its priceless to me. Its the year I was born. I’m looking for a 1959 Canadian club vintage bottle does anyone know where I can find one? I recently mistakenly opened my mothers and am trying to replace it. please help! Woo, Bobby! Time to ‘fess up to mpmma. Good news – there are still lots of them out there from the 1950s. Better news – they are really inexpensive. Under $100, often way under. Between $25 and $50. Open and enjoy. I have an original sealed and stamped 1963 bottle of crown royal in the original box that was owned by a Vegas mob king pin and handed down over the years… Just wondering the estimated value. .. These old bottles are turning up more and more often and I am afraid the value is not very high. Probably somewhere around $50 o $60. Old Canadian whisky does not really appreciate in value as there is no collector’s market. These are probably worth in the $30 to $60 range. Best to just open them and enjoy. If there is no tax stamp then it is very difficult to tell the age. The value does not go up so it is worth the same as a new bottle, provided it is in good condition. I have a bottle of Order of Merit tax stamp 1969. It is sealed and listed aged 12 years. I also have a Crown Royal same year sealed and shows Waterloo on label. What are the worth?? Old Canadian whisky does not go up much in value and if anything values are going down since e-bay stopped selling whisky. These ones are probably worth between $40 and $70 but it will be very difficult to find a buyer. I’d suggest you open them for a special occasion. It’s about the samw whisky as the 1963. A good find! Thanks for the reply, have got the velvet bag also, am in the UK, any ideas on how much it might sell for? In Canada you can find bottles such as this one fin the $30 to $70 range. There is a whisky auction in Germany that seems to get a bit more for them. http://www.whiskyauction.com I think. I have loads of these old bottles and i just open and drink them. I have an old Seagram’s Crown Royal empty bottle (25 Fluid ounces), with damaged blue box with stamp marked 258-A and $6.40, purple bag marked only with “Seagram’s”, and a House of Seagram Certificate of Registration numbered C51128. Anyway to tell how old the items are and their value? Sorry to have to tell you that once the bottle is opened it loses all its value. The $6.50 price tag would put it in the 1960s or so. A full bottle in pristine condition is worth about $65.00. All production ended at Waterloo in Nov 1992. The fire came after operations ceased and was just a coincidence. It was not the cause of the plant closing. The word Waterloo appeared on labels long after the plant closed. 30 year old whisky distilled at Waterloo in 1992 would not come on the market until 2022. The name Joseph Seagram and Sons Limited is a trademark and I believe it is still in use. If there is an LCBO logo on the tax stamp then this bottle was sold and most likely filled, in Ontario. No one keeps track of serial numbers, nor did they ever. It’s marketing. Other numbers and marks on the labels are more likely used by the printer to keep track of batches of labels for quality control purposes, not whisky. These old bottles taste wonderful and are rarely worth more than about $65. My advice is to open it on a special occasion and enjoy it. Yes, I intend to keep it and break it out on a special occasion. It’s quite clear that there’s really not much of a premium on these older bottles, and definitely not enough to bother selling it, as opposed to keeping it as an interesting story on a special occasion. I’m just a naturally curious person that likes mysteries, so I was trying to figure out how to narrow down the age of the bottle. After my initial post, I asked my father-in-law (who is the one that gave it to me) about it. He confirmed that it came from his father. He got it when his father (my wife’s grandfather) passed away a while ago, and just never thought about it until they moved recently. So, it seems likely to me that it was from quite a while ago. My wife’s grandfather didn’t really drink, and my wife didn’t think he ever drank Crown, so it was probably a gift. I figured if the identifying pieces that I noted from the bottle were able to narrow it to a rough range, I might be able to guess which special occasion (wedding, anniversary, graduation, retirement, etc) it was. I just thought it would be neat to be able to share the story of the bottle and the likely originating occasion of my wife’s grandfather when we drank it, to be able to properly honor him, as well. He lived in NJ his while life (and did the snowbird thing down here in FL during the winters), so I don’t know what occasion he would have to be in Canada, but the lack of the date stamp that I see on other ebay auction photos, as well as the lack of inscription on the back referring to importing, did lead me to believe that it was sold in Canada. I think the main things that differ from other pictures I’ve seen that may help in dating it are the text on the back label (referring to the youngest being nine years, as opposed to ten years on some labels and being omitted completely in most labels), as well as it stating that the contents are 25 fluid ounces (as opposed to quart, 4/5, or 750 ml). Just out of curiosity, what colour is the cap? Davin, it is the gold cap, not a purple cap. I have an old 8-year-old here called McGuinness OLD CANADA from the McGuinness Distillers in Toronto. The excise ribbon on the cap is dated 1963 so it was purchased outside Canada. The label is a painting of Cornelius Krieghoff’s Bilking the Toll (1860). No proof or % or weight listed. It’s been well cared for because the fill line is up into the neck. Stored by an old lady, recently deceased, along with dozens of other collectibles in dark basement cupboards. Should I sell it or drink it? Drink it, but make an occasion of it. I have a perfect bottle of the Crown Royal xr in the red bag. Complete and Perfect with seal. It is very nice whisky but not worth a lot. Maybe $50 to $70. My grandfather was a glass designer at Consumers Glass in Montreal in the 30′s and 40′s. My mother has told me he was one of the designers of the Crown Royal bottle made for the Royal Visit. She has an empty bottle which has a purple cap. She claims that it is from the table from the banquet which was held at the Windsor Hotel in Montreal and that only the bottles on the table had the purple caps. I have done some research and found that there are more than 5 bottles with purple caps! Do you know how many were made and what years? Also, once the bottles were made at Consumers Glass, wouldn’t they have been shipped to the distillery and then to places during the Royal visit? Do you know where or when in the visit Crown Royal was introduced? I have a hard time believing “the story” of my grandfather’s bottle and feel he was given an empty bottle as a souvenir from the company. This is good information. You should be proud of your connection. That was very special whisky. The early bottles, including those sold in the stores had purple caps. There were thousands of them produced over a period of years. By chance I tasted whisky from one of those early bottles in New York a few weeks ago. It had been at auction at Bonham’s and did not sell. They opened it for me to taste. Sadly, too much had evaporated over the years so it was not as great as others I have tasted in the past. The whisky was first introduced in 1939. There is no record of the king or queen ever tasting it. It was not ever poured at an official function. What happened is that Sam Bronfman used his connections to have a couple of cases put on the train that the royal couple were travelling on. This was complicated by the fact that they changed trains part way. There is no evidence that the cases placed o the trains were ever opened. However, it was a pr coup and the whisky became huge in Canada. Thank you for the information. I gather the bottle my mother has, was given to my Grandfather when the bottles were being manufactured before they were sent to the distillery. I found a bottle with the purple cap on Ebay for $29.00. I guess the sentimental value is far more valuable than the bottle itself. I have a Crown Royal bottle, 1/2 gallon on a swinging pedestal with the seal stating 1964. Is this rare and what is it worth? Not rare, no, but very good drinking. You might get $65 to $100 for it, if you can find a buyer. 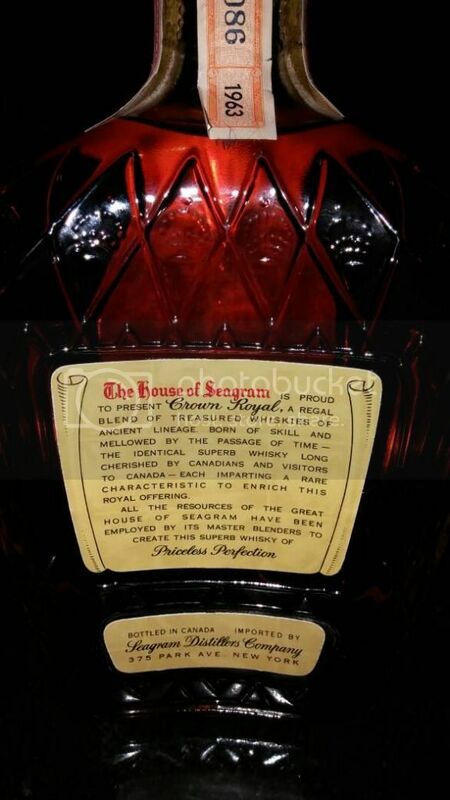 I have an unopened, untampered 1939 Seagrams Crown Royal “Rare Old Canadian Whiskey” …what is the bottle worth? Hard to say. No more than $200, probably a lot less if you can even find a buyer. Please contact me at Ernest.arsenault@hotmail.com about that bottle of 39 Crown. I have a 1969 bottle of Seagrams crown royal. 750 ml. Sealed with the serial number and date on it. Are you still looking for this? I am looking for a 750ml bottle of the 60s seagrams crown royal. I need it to be unopened with the bag and box. Any one has this i can buy?? I have no idea how a third of the bottle is empty, because both paper seals are intact. even the plastic wrap that has fallen away still seems to be in one solid piece (unless he did a good job of faking this?). Someone estimated it’s age at 50+ years and I believe it could be from a navy officer’s stock due to the gum residue where that sticker would have been. Also, there is no tax stamp on the paper seals. I plan on opening this bottle up this weekend… Hopefully it will at least be tasty if it happens to be worth anything of significant value. I have a 750ml of 1963 Seagrams Crown Royal FINE DE LUXE. Excellent condition. Stickers are vibrant. Bottle has never been opened. What would the value be? About $65, maybe a bit more or less IF you can find a buyer. Is your unopened 1963 bottle of crown royal still available for purchase? I have a 1962 Bottle of Crown Royal Gold Cap Tax Never opened Tax label…. Is it worth anything??? These old bottles are interesting but not worth much. If I were you, I’d open it with friends and enjoy it. I am interested in empty Crown bottles, any ideas? I etch them. Put a sign up in the window of your local liquor store. I quit drinking more than 25 years ago. At that time I stashed all my booze in a box and put it away. I recently pulled out the box and found a couple bottles of Crown Royal. One has a plastic seal on the cap, but the other has two stamps on the cap, one is a serial numbered tag and the other bears the date 1969. From reading these posts, could I be correct in assuming that the bottle was from the first year at the Gimli Plant??? I plan to give this to my son who has a pretty extensive collection of liquor. If the date on the stamp is the date is was bottled then it’s six years older than he is. That for him would make it a collectible. That’s all I’m interested in. Is my assumption correct?? The date on the stamp is the year the youngest whisky in the bottle was distilled. The Gimli plant opened in 1969 but production of Crown Royal remained in Waterloo. Gimli was dedicated at VO at the time. That is a nice bottle. Your son is lucky to get it and keep it in the family. Hi! My grandfather gifted me a bottle of Crown he received from Jackie Gleason (gifted to him one Christmas as he was his news paper carrier in NY). The box is personalized with Jackie Gleason’s label, but is not signed. The bottle is double sealed and stamped 1969. I can not decide if i should I keep this in tact or open it and share it with my grandfather before he moves on from this life. I wonder if you have an opinion? It has no real monetary value. Share it and make a happy memory. Desperately seeking a bottle of unopened 1960 Crown Royal…can you help? Kevin, I have a 1960 unopened bottle of crown. Great shape too! I have a 757ml bottle of whiskey in a red, satin-lined box. The front of the bottle reads: Gimli Dedication Canadian Rye Whiskey. The back of the bottle reads: This special blend was prepared from the barrels of Canadian rye whiskey distilled in our Gimli distillery on August 21, 1969, and personally autographed by the invited guests at the official opening ceremonies held on that date. The whiskey has been quietly maturing at Gimli for eight years and now this bottle is presented to you as a reminder of that happy occasion. We are pleased and proud that the combination of Manitoba’s people, water, grain and clean air has resulted in such a successful venture. My father received it as a prize in a curling bonspiel in Gimli. Can you give me any idea of what the value this bottle might be. Yes, I have seen that bottling. These commemorative bottles are a special gift for staff but have no real value beyond the regular bottlings. It is unlikely you would get more than $100 for it IF you can find a buyer. Hi where can I purchase full bottles of vintage Canadian whiskey mostly segrams crown royal and Canadian club but I’m open to almost anything I’m in Ontario and have searched kijiji and eBay but only find empty bottles for sale if you could let me know where to find it or what search terms to use that would be highly appreciated I’m looking for anything with a tax stamp so I’m guessing 1980s and older. Advertising old bottles of whisky is no longer permitted so they have become very difficult to come by. I asked some estate sales people and they told me they can’t sell them either. I’m interested if you still have them. I paid $65 for bottles that age and older back when there was still a market on e-Bay. I may have overpaid but I felt I got good value. Not sure what you would get for them now, but probably less since the market has dried up. If you can find a collector you could get more though. Sorry not to be more specific. Trying to verify authenticity and worth/value of a bottle of Crown Royal with a label that reads “Crown Royal” with “AGED 15 YEARS” at the bottom, “D6P10D” is in the bottom left corner and “4559I” in the bottom right corner. The back has a silver sticker with 5 line of some type of Asian (Chinese, Japanese, etc.) symbols and a clear sticker underneath that says “PRODUCED AND BOTTLED IN CANADA BY JOSEPH E. SEAGRAM AND SONS, LIMITED WATERLOO•ONTARIO•CANADA BLENDED CANADIAN WHISKY” and “4360 G” in the center of the bottom of the label and “40*GL” in the bottom right corner (the * is actually a degree symbol). I cannot find any information on this bottle…any help or info would be greatly appreciated! I have a sealed 1905 – 1980 alberta 75th anniversary crown royal with the bag and box. It is 710ml and the tax stamp is 1970. Is this anything special/value or should it just be enjoyed? There is no real collector’s market for this sort of thing so it has not great value. Best to enjoy it with friends. Whisky schenley canada cup 1968,6 ans jamais ouvert avec scéllé alors 52 ans age pour collectionneur Me contacter par couriel seulement faite une offre!!! How do I find out the date of my Segrams Crown Royal? There does not appear to be a date on the stamp. The certificate of registration says B479553. I have five sealed bottles in sack and box I would be willing to sell for the right price. I am guessing they are from the late fifties. If there is no date on the tax stamp then you can only guess. I have a few square whiskey bottles with the word “canadian embossed on two sides from top to bottom. Any idea whatyear or brand they are? And are they worth anything? Thanks, Jim Komonko. Sorry, I am not familiar with these. As whisky bottles they have no value but maybe try a bottle collector. I am interested in purchasing old unopened bottles of crown royal. Also a crown royal xr red box/bag. Hi all. I am a rookie at this so please bear with me. I am a Crown person and enjoy it and am collecting to save. How does this site work if you want to communicate with other poster directly about their items listed. I am interested in getting more info on the older Crown items mentioned above. This site is not intended as a place to buy, trade or sell whisky. However, some people do leave notes in the comments sections when they are looking for a particular whisky or when they want to sell one. This is completely passive so your best bet is to scan the comments and see if anyone has left contact information, or leave your own. I have a bottle of Crown Royal that I bought in 1967 when I graduated from the university. Unopened, in original box with bag and tax stamps. No evaporation. Kept in a closed chest. If you are interested, contact me with the price you are willing to pay. Wondering if you still have the CR 1967? Did you find out the age of your bottles and are you still interested in selling? Hi , I have a purple bag , that has a gold outline of an S (2.5″) printed sideways on the bag. It looks like a dollar sign. The bag looks identical to the Crown Royal bags except for the S. Does any one have any idea if it is a Seagram’s bag and what year it might be. I have a few bags to sell but this one is different. I have to say that Crown Royal was always my favourite although I don’t drink as much anymore. Hi I’m looking to purchase an unopened Crown Royal with the purple cap, ideally from 1939. 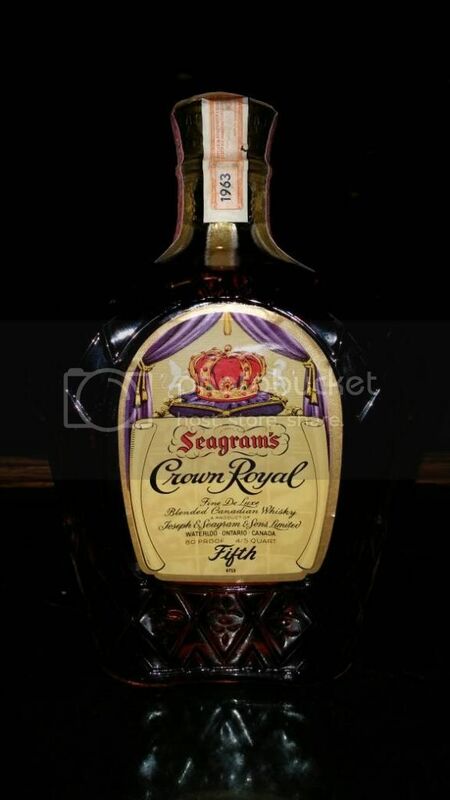 I am interested in more information on 1950′s and 1960′s Seagram’s Crown Royal. Also, CR Purple Cap. Willing to communicate via email. I just got a bottle of 1964 crown royal, little to no evaporation, and still has the tax sticker in tact. Comes with a bag and the original box. Anyone have ideas of the value and where I can possibly sell it? I wish I had one to sell you Michael as $500 is extremely high priced. Good luck. I know its wayyy over priced but i figured if i put out the good money someone will find it. This is one of the few Canadian whiskies that are really collectors’ items. 1939 was the first Crown Royal, available only in Canada, and it has a purple cap. Worth $500 I think to the right person. If you find one, let us know. Several years hap a purple cap that i know of. I would settle for one of them if someone could contact me pls. I have a bottle of Noblesse Canadian Whisky (aged 10 years) from Canadian Gibson Ltd. It says it is bottled in bond and 10 years old. The bottle is unopened, the seal is in tact and the tax label says 1963. I never heard of this brand before. Wondering if it may be worth something, or if I should just drink it? I’ve not heard of it. Can you send a picture? I could – but can’t figure out how to attach a picture to my reply ??? There is an e-mail address on my contact page. Could you send it there and tell them I asked you to so they send it on to me? Many thanks. Still in the market looking for bottle info on a bottle of Seagram’s Crown Royal with the purple cap. Just sent you an e-mail Mike. Looks like we misunderstood each other. I am still looking for a bottle of Crown Royal purple cap. I have 3 full bottles of Crown Royal Fine De Luxe that are unopened with the seals intact. they are years 1969, 1975 & 1980. Any idea of what they are worth? Are you interested in selling these Travis? I have 3 full bottles of Crown Royal Fine De Luxe that are unopened with the seals intact. they are years 1969, 1975 & 1980. they are 750ml. Any idea of what they are worth? I am interested in purchasing one of these, if you are selling / still available? Still in the market for info on a Crown Royal Purple Cap. Can share e-m if you wish. Do either of you still have these purple cap crowns? I would love to get one for my grandfather’s birthday. Thanks! I am from Germany and have found an old whiskey bootle Crown Royal from my grandpa. Now it would be intrested for me, from which timefram this bottle is. Can you help me to get these information? I can send you pictures from the bottle. Sure. My e-mail is on my website. i have an inherited collection of whisky most of it crown royal dating 1965 to 1975 as well as some other brands dated 1945 1947 all still sealed with the taped cap i would like to sell this collection if possible how do I proceed? I am interested in purchasing an older, new, unopened bottle of Crown Royal. Preferably circa 1970ish. If anyone has one available for sale, please contact me. I have in my possession a purple nylon tie with the wording Crown Royal at the bottom. This tie was given to me by a liquor store manager in Gimli, Manitoba i believe at least 20 to 25 years ago. The tie comes in a cardboard envelope and written on the outside in ink is a wording Valuable Collectors Item. I have tried to get any information that i could on this tie, but to no avail. I believe it was probably a promotion item that was given to the store manager by Seagrams at that time, unfortunately the manager has passed. I was am employee at the Gimli plant for 30 years, retiring in 2001. Davin, Great website! I have an old bottle of Crown Royal with some interesting tax labels on it. The first one over the cap is a Canada Excise label #E0175784 1960. I am guessing this was put over the cap in the year 1960? Over this label is another one from the US Internal Revenue which also says Seagram’s Distillers Company New York, NY. It has a 9-digit serial number but nothing that looks like a date. The third label on it is from the Pennsylvania Liquor Control board applied to the shoulder of the bottle and it has 1969/1970 as dates on it. If the Canadian excise label is actually from 1960 and the Pennsylvania LCB label is from 1969/1970 that means this bottle may have sat in limbo in warehouses for ten years before it finally made it to a retail store where it was sold? Does that sound plausible? I am just wondering if the whiskey in this unopened bottle might be the old good stuff or the later not-as-good stuff. Thank-you for your time…. 1960 is the year of distillation – when the spirit was put into a bonded warehouse. I have a box of 1963 miniatures box bottles and tax stamps in tack. Is this worth anything or would I be better to enjoy a 54 year old whiskey? Hi! I am looking for a sealed bottle of Crown Royal from the 60s for my dad! If anyone has one please email me @ samfields0207@gmail.com. I have a 1966 Seagram’s Crown Royal quart with box & bag unopened with all seals intact (gold cap). The bag has never been untied. Should I untie it to show the bottle for sale? That’s up to you, It is not a real collector’s item so I doubt that would decrease the value.